Employees are the backbone of any successful organization. They’re the face of the company through interactions with your customer base and drive all facets of operations. Consequently, it should go without saying that keeping your employees content, motivated and comfortable in your organization should be at the forefront of both short and long-term goals. Of course, the inherently qualitative aspects of such goals can present a problem if a company does not employ the most appropriate and effective measures to gauge employee satisfaction. To that point, employee engagement is any company’s first line of defense in engaging, analyzing and, most importantly, acting upon the people data that is instrumental in developing and maintaining a happy workforce. The most effective forms of employee engagement are ones that foster emotional commitments from team members towards an organization and its goals. In establishing such engagement, employees are driven to provide higher quality work and productivity which naturally leads to superior customer service and, ultimately, increased referrals and sales. Therefore, when coupled with an efficiently run company, employee engagement can also lead to higher profits and shareholder returns. In a crowded marketplace where even the smallest of differences between competing companies can differentiate the winners from the losers, impactful employee engagement is a necessity for establishing and maintaining a healthy, productive organization. In fact, according to recent research, businesses with thoroughly engaged workforces averaged 2.3 times greater revenue growth over a 3 year period than those with just average employee engagement levels. Employee engagement can be improved by both elaborate, wide-sweeping initiatives as well as small, but still impactful efforts. Whether big or small, however, the processes and procedures adopted must be deliberate, well-planned and organized to be successful and never left to simple intuition or gut instinct. A quantitative approach to engagement is rooted in people data from surveys, polls and continuous feedback systems and provides the ever-important metrics organizations need to measure sentiment levels. Low levels in particular categories reveal insight into where a company should begin their engagement initiatives. To encourage companies to adopt their own employee engagement initiatives and truly leverage the power of a fulfilled workforce, Hyphen has put together 12 simple ideas to help create a happy, productive team. Collectively, these techniques can serve as meaningful building blocks to a content workforce that ultimately boosts the bottom line. Team members, no matter their position within a company, feel more valued when included in the decision-making process. When topics like organizational goals and direction, performance, job openings or even managerial and leadership challenges — traditionally all conversations held behind closed doors — are openly discussed with a workforce, employees will feel included and experience a greater sense of belonging. Companies that restrict such discussions to small, exclusive groups rather than creating a more inclusive atmosphere are often the first to exhibit signs of unhappy employees. To defend against the negative impact of exclusivity, information that affects the entire organization should not be treated as proprietary to management but, instead, the concerns of everyone. This would include information used to strategize, gauge, innovate and anything else needed to succeed in both the short and long term. Decisions that impact all workers should be shared freely with those workers. Positive recognition drives human behavior across nearly every aspect of life — work obviously included. When a team member completes a complicated project, achieves certification or meets a sales goal, celebrating as a team or, at the very least, announcing the accomplishment, can help motivate all employees and make them feel engaged and valued. Whether that celebration includes a team happy hour, special event or an announcement across a company's social media channels, allowing employees to share professional accomplishments throughout their social circles establishes deeper bonds between employees and the organization. In another recent survey, 75% of full-time employees recognized by management at least once per month felt satisfied with their position. Such levels of satisfaction can ultimately lower attrition rates over the long-term and increase productivity for the company. Out of fear of repercussions when voicing their true thoughts, many employees feel far more comfortable providing honest opinions and insights through anonymous channels. For this reason, anonymous surveys can play an important part in an overall employee engagement system. Through our own work in implementing anonymous feedback tools for companies, Hyphen has been able to provide organizations several employee-related improvements with such tools — including higher retention rates, a louder voice for the individual employee, removal of fear, judgment or retribution and work environments far more hospitable to innovative thinking and less susceptible to anxiety. However, as important as it is to implement anonymous feedback tools, such systems will provide no advantage unless the resulting data is quickly transformed into action. When utilizing Hyphen's own innovative feedback solutions, companies can be assured the anonymous feedback provided by employees does not fall on deaf ears and, thus, create more issues than they started with. Our Smart Insights will help you turn feedback into action plans to implement any necessary changes. Warranted or not, many employees feel as if they're intruding on management or needlessly occupying a superior’s time by sitting down and having an open, frank conversation with company leadership. To avoid such hesitancy and break down barriers that impede healthy communication, organizational leadership should set aside specific blocks of time each week or month for the specific purpose of keeping communication lines open with team members. Although the time constraints on company leadership can be harsh and demanding, studies have shown as little as six hours per week spent interacting with company leadership can yield up to 29% greater feelings of motivation and inspiration. In other words, small but frequent investments of time can create exponentially greater benefits for both employees and the organization as a whole. Whether it's during old-fashioned watercooler talk, while sharing a bite to eat over lunch or in brief moments when passing each other in the hallway, employees are already sharing opinions on how to make positions and tasks better and more efficient. If a company is not actively harnessing such feedback into actionable insights that create tangible change, they are missing out on a significant opportunity to improve the organization. Given the ubiquitous nature of smartphones, leveraging that endless sea of mobile devices is a convenient and efficient way for companies to gather such feedback if done intelligently. Hyphen’s mobile friendliness and open-ended, continuous feedback model will always ensure management is made aware of employees’ innovative ideas. In fact, interactions between employees regarding improvements, both hypothetical and real, are often the foundation for creativity and innovation that can propel the company into a successful future. By collecting and acting upon these wellsprings of innovation, companies will often realize an increase in morale, motivation, problem-solving and overall productivity. Organizations should be sending surveys frequently and asking their people for their insight into improving various aspects of the business. Successful, motivated employees want to expand their own skill set and knowledge base, sometimes for career advancement, but other times just from curiosity and desire to learn. Allowing employees to occasionally shadow another team member or receive training on different roles within the organization will help them feel engaged and better understand how the different moving parts throughout the company work together. By encouraging a more widespread understanding of other components within the organization, companies can develop and maintain a more cohesive relationship between different departments. This cohesion can improve healthy lines of communication throughout the company and increase productivity along the way. Many times, departmental cross-training — as well as team members new to a company or early in their career — may find themselves more interested in other positions than their own. Assuming there is an open position and available backfill if they were to transition to a new position, allowing employees to make internal transfers or lateral moves allows them to feel more successful in their career and demonstrates an important flexibility from the company. Once employees understand that an organization is open to such moves, it creates an environment where employees feel important, engaged and fulfilled within their roles. While at first glance the term might seem to mean highly organized or elaborate events, effective internal networking opportunities don't have to be anything more than a simple happy hour, luncheon or casual get-together. No matter the time or place, these events allow team members to spend time together outside of the normal work environment, getting to know each other on a more personal level. Many employees place significant importance on community building and social responsibility. Companies can demonstrate a sincere commitment to such endeavors by allowing employees to participate in community service while on company time. To further embrace a sincere commitment to volunteering, organizations can even allow team members to select specific charities and causes to concentrate on during a future team outing. With 79% of people now preferring to work for organizations they consider socially responsible, organized team outings for community service provide employees the opportunity to deepen their relationships outside of the workplace while also improving the community. Employees that want to advance their careers will strive for a level of success that the entire organization will benefit from. Employers can foster this motivation by paying for classes, allowing team members to attend workshops during the workday or assigning mentors within the company to help guide advancement and improve learning beyond an employee’s normal responsibilities. One of the biggest costs in the modern workplace are those associated with healthcare. To help mitigate such costs, effective health and wellness programs can reduce often overwhelming healthcare costs to an organization. In fact, more than two thirds of organizations that offer health-related initiatives indicate their efforts range from somewhat effective to very effective in reducing the cost of healthcare. Furthermore, research indicates such initiatives have collectively returned an average of $2.71 for every dollar spent on wellness programs in recent years. By offering such simple solutions as discounted gym memberships, lunchtime yoga sessions, monthly walking competitions and healthy snack options in the office, companies can reduce their healthcare costs while improving overall employee engagement. Both inside and outside of the workplace, employees have interests and projects they are passionate about. When specifically speaking of such projects and initiatives within the work environment, companies would ultimately be well-served in allowing employees to pursue those endeavors as long as they provide some benefit to the company itself. Allowing employees to dedicate just a few hours per week of company time to engage in those interests and projects can drastically improve employee engagement. Again assuming the projects hold a benefit to the company, these interests — perhaps ancillary to an employee’s normal responsibilities, but still personally important — can provide significant dividends to the people they benefit, the employees that are involved and improve the image of the organization itself. Create an open communication network or system that enables employees to be a part of decision-making discussions or proprietary information. Give kudos and accolades to employees for their performance and success, but make it fun and entertaining for everyone! Nurture an open-minded work environment where employees feel empowered to voice concerns without fear of backlash. Provide employees opportunities to share their voice and give feedback on anything and everything in the business. Establish a system where employees can fit into different roles for the day, whether training with or shadowing their coworkers. One company that stands out with their engagement strategies is Southwest Airlines. They feature employees that perform above and beyond in their roles across various public channels to acknowledge their pride and appreciation for everything they do. On a weekly basis, the CEO gives a shout out to publicly praise employees deserving of recognition for their efforts at work. Southwest’s magazine also features employees each month that give recognition in a similar fashion. Google allows employees to spend up to 20% of their work time to pursue special projects. Giving employees the freedom to pursue projects of their choosing enables them the autonomy to create and innovate without restrictions. In essence, it brings out the full potential of their skills through true engagement. Creating an environment like Google’s workplace democracy can inspire employees and enables a more open channel of communication. When every employee’s opinion is openly welcomed and considered, employees are better connected to the people and the workspace around them. Google facilitates this positivity through leadership development and employee rapport. They use company-wide surveys to collect people analytics that help push innovation and change in their engagement strategies. At Screwfix, a large multi-channel retailer of trade tools based in the United Kingdom, employees are given a opportunity to provide feedback without rules or guidelines to their managers. The concept focuses on improvement, where employees have the ability to give feedback on everything from how things are going in the business to how management could improve. Any and all ideas for improvement are welcome. This concept encourages employees to be innovative because they have no restrictions holding their imaginative thinking down. One of the greatest challenges to engagement is the lack of development opportunities. One way to fight disengagement from these challenges is to cross-train your teams with a “shadowing program.” In essence, employees would shadow one another to learn what coworkers do during a typical day in their position. Zappos enables employees to “shadow” coworkers in other departments for a few hours to gain a better understanding of the work they do. This type of regularly scheduled cross-training not only develops your team’s skills overall, but also gives your employees insight as to what everyone’s job function demands. Facebook’s mission is “to make the world more open and connected.” Through this strong social message, Facebook employees strengthen the community by doing social good — showing people that the company’s work improves people’s lives. With its altruistic agenda, Facebook employees have a lot of pride in the company that drives their engagement. The bigger picture they paint for the work they do enables employees to make a lasting impact and change on the world. This sense of pride is a major driving factor in Facebook’s engagement strategies. 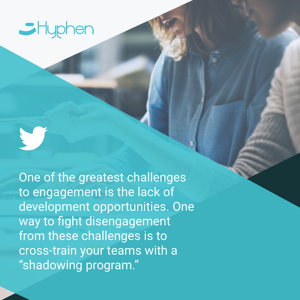 As always, Hyphen is here to provide our own insights and expertise to help organizations maximize their employee engagement and, thus, their short and long-term success. Remember, the more feedback you collect from your people on these various employee engagement initiatives — and integrate insights based on people data from surveys, polls and continuous feedback mechanisms — the more you will be able to gauge their effectiveness and improve as needed. Request your demo and see the success of actionable employee engagement surveys and people analytics!